Developed by well known, technology-based learning products marketer LeapFrog Enterprises, the Pentop has opened up an entirely new class of learning opportunities that were seemingly impossible to conceive of until now. "Our new FLY Pentop Computer platform has completely blown the doors off of any prior learning products for tweens," said LeapFrog President Jerry Perez. "It's all about making learning accessible, engaging and effective, and we believe the FLY platform can make a very positive and enriching difference in the lives of busy tweens." "Disney Publishing has joined forces with LeapFrog to develop the W.I.T.C.H. — FLY Journal for fans of the popular Disney book series." Teen girls are encouraged top join THE WITCH CLUB online. Satan is working relentlessly to steal your child's innocent. What is the W.I.T.C.H. Journal? Drop by for a spell. 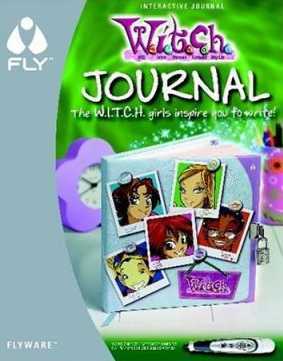 The W.I.T.C.H™ girls inspire you to write in the FLY™ W.I.T.C.H. Journal. Write your ideas, share your feelings and keep your secrets with this journal that has more than 300 juicy questions that will get you thinking and writing. 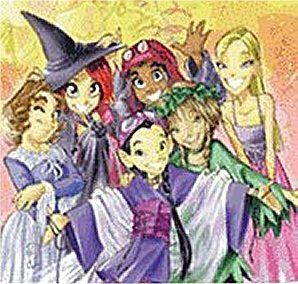 You choose the topic to write about, or ask Will, Irma, Taranee, Cornelia and Hay Lin for step-by-step help. Who are the W.I.T.C.H. Girls? Let's search further into who the W.I.T.C.H. girls really are? New cartoon series from the Italian division of Disney. The plot is about five girls possessing different powers to manipulate their surroundings. One has 'water' one has 'fire' etc. These girls join in the fight against evil as they are destined to do. The girls have been selected to defend the great wall that separates different parallel realities. The evil forces want to tear down this wall so they can rule all the different worlds. The two evil leaders have kidnapped one of the girls' friend, Elyon and uses the Elyon figure to lure the W.I.T.C.H. girls. The girls discover the powers hidden within them partly by themselves, but don't get the whole picture before Hay Lin's grandmother, Yan Lin, tell them the story of their destiny and hands over the jewel of Kandrakar. Will is the holder of this jewel, and the leader of the group even though she's new in town. Did you read that? ... The age segment for the series is clearly teenage girls. Do you think it's just coincidence that tons of WITCHCRAFT movies, shows, school supplies, clothing, books, and now the FLY Pentop Computer, are all being directed at our children? Not on your life. This is the work of the Devil. Don't be surprised if people scoff and laugh at such a notion. What do you expect from a society that has brutally murdered nearly 50,000,000 of it's own children? God hates the sin of witchcraft, because it destroys the Biblical faith of young people, and Satan knows it. Affiliations: The Oracle (and the Sages) of Kandrakar, Ms.Rudolph/Galgheita, Queen Elyon of Meridian, Vathek, Caleb, Luba, Orube (see below), Kadma and Halinor, Jewell the watershade, arguably Interpol agents Medina, McTiennan and Ralph Sylla. Base of Operations: Heatherfield, a city in the U.S.
History: W.I.T.C.H. are five young girls (13-14 years old) chosen by the Oracle of Kandrakar to protect the world (and on occasion Kandrakar, which is in another dimension, and other worlds as well) from evil powers from other dimensions. Comments: Created by Elisabetta Gnone. Copyright to Disney. There is also a manga (rather than the original pseudo-manga) version for the Japanese market, with some minor differences. There are ONLY two sources of SPIRITUAL power in the entire universe: God and Satan. The only power which Satan possesses is the power which God has allowed him to have (Luke 4:6). Thankfully, Satan's days are numbered (Revelation 12:12). The Word of God is the truth by which we can try (i.e., test) the spirits. We read in 1st John 4:1, "Beloved, believe not every spirit, but try the spirits whether they are of God: because many false prophets are gone out into the world." The Bible openly condemns witchcraft in all its forms. There are NO exceptions. Witchcraft is of the Devil, and is rooted in Satanic power— spells, enchantments, palm reading, séances, mind reading, tarot cards, horoscopes, astrology, psychics, necromancy, levitation, magic, sorcery, wizardry, clairvoyance, potions, et cetera. These practices are all of the Devil, works of darkness, which bring the judgment of God upon those who dabble in them (Galatians 5:19-21; Acts 19:19). Witchcraft is a Horrible Sin! "Now the works of the flesh are manifest, which are these; Adultery, fornication, uncleanness, lasciviousness, Idolatry, witchcraft, hatred, variance, emulations, wrath, strife, seditions, heresies, Envyings, murders, drunkenness, revellings, and such like: of the which I tell you before, as I have also told you in time past, that they which do such things shall not inherit the kingdom of God." Witchcraft is a road to damnation! I am perplexed as to why any Christian parent would allow their child to dabble in the evils of witchcraft. Please do not be deceived, witchcraft is more dangerous than arsenic to your child's spiritual growth. Teach your child the Word of God and lead them in the righteous path of Jesus Christ. Walt Disney is leading the way in corrupting the world's children, and their W.I.T.C.H. series is straight from Hell.